"Oh, I just wish your father was still alive so he could take a little of this blame." In addition to memorable roles in such prominent films as Taxi Driver, Private Benjamin, and his Oscar�®-nominated role in Broadcast News, Albert Brooks has written and directed six acting vehicles for himself. Mother marks the fifth such effort (1999's The Muse being the most recent). While none of these efforts have ever been a big hit, some, such as Lost in America and Defending Your Life have proven to be entertaining, memorable, and a suitable showcase for Brooks' brand of sardonic, intelligent humor. Alas, I don't believe that Mother will be looked back upon with the same level of regard as some of these other efforts. John Henderson is a reasonably successful B-grade science fiction writer who suddenly finds himself in an uncomfortable point in his life. We meet him in a lawyer's office sitting next to a cold woman who is about to become his second ex-wife. What's worse, he is suffering from writer's block, making it impossible to submerge himself in his work to forget the disaster that is his romantic life. Convinced that his strained relationship with his mother is somehow the cause of all his difficulties, he decides to dedicate himself to solving this relationship and, so he reasons, to getting his life back in order, professionally and personally. The manner in which he determines to go about doing this is the film's gimmick. He decides, at age 40, to move back in with his mother. The previous paragraph, which describes, more or less, the events of the film's first thirty minutes is the set-up for the remaining hour and fifteen minutes of sometimes humorous, sometimes not, and almost always sarcastic dialogue between John and his mother. Brooks, naturally, plays John. In a rather ingenious piece of casting, Debbie Reynolds plays Beatrice, his mother. I say ingenious because Reynolds is known to be, in real life, a difficult mother. The film Postcards from the Edge is based on a semi-autobiographical book and screenplay by her daughter, actress Carrie Fisher. The film's only remaining major character, John's maternally-dependent little brother Jeff, is played by Northern Exposure star Rob Morrow. While Mother is consistent with Brooks' brand of "faux cinéma vérité", it ultimately sinks into mediocrity because of its script. I was entertained, but only once did I laugh out loud (the lingerie shop scene, you'll know it when you see it). Neither mother nor son display any real range in this film, relying on the same brand of repartee from start to near finish. The film's closing act comes across as rushed and rather dissatisfying because it doesn't seem to be in keeping with the characters we have become acquainted with. Diehard fans of Brooks' brand of comedy and the amalgam of wide-eyed insecurity and sarcastic wit he plays in almost all of his films will likely be somewhat pleased that Mother offers more of the same. However, having enjoyed much of his previous work and knowing what Brooks is capable of both in front of the camera and behind it, this film was a disappointment. Image Transfer Review: The image displays very good clarity with solid shadow detail and a very clean print. Colors tend slightly towards the mute but not enough to distract. Mild film grain is present but generally not visible at all from normal viewing distances. Overall, a very pleasing visual presentation. Audio Transfer Review: In the very first scene of the film, there is an outdoor transition rich with ambient city noise. Unfortunately, this marks about the last time that the surround channels are utilized for much more than bolstering the film's music. With few exceptions, Mother's audio presentation is very front channel-centric. This is a loquacious film with little in the way of action, but several good opportunities for ambient surround traffic are passed up. Marc Shaiman's original score comes across very rich from the fronts, offering deep lows to what is an otherwise sonically limited presentation. Mother also features Dolby Digital surround tracks in both English and French. Extras Review: Other than the theatrical trailer, presented in stereo, this is a movie-only DVD release. 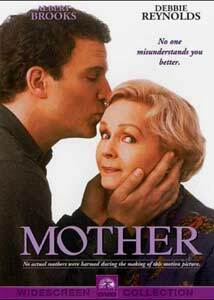 Far from Albert Brooks' best work, Mother suffers from a weak screenplay and characters that are one-dimensional to a fault. A very tired effort.